What is Connor McDavid's reward for helping the Oilers dispose of San Jose in his first-ever Stanley Cup playoff series? Another dose of NHL irritant Ryan Kesler and the big and heavy Anaheim Ducks in Round 2, starting Wednesday at 10:30 p.m. ET. ​After scoring to gain the upper hand on Connor McDavid in their first centre-on-centre matchup of the season, Anaheim Ducks agitator Ryan Kesler paid Oilers' star high praise. "The guy [he] reminds me of is Mike Modano in his prime, the way he'd pick up a ton of speed through the neutral zone and if you didn't slow Modano down early, you were in trouble," Kesler, one of the top two-way pivots in the NHL, told reporters of McDavid after the Ducks' 4-1 win at Edmonton on Nov. 15. 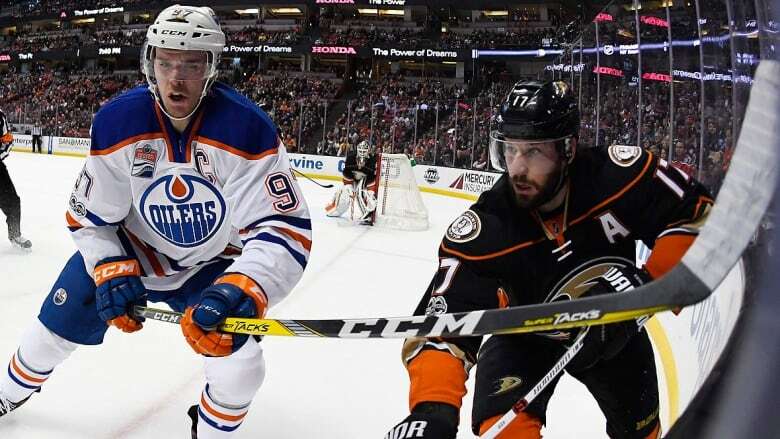 Now, after checking off another box by helping Edmonton dispose of the reigning Western Conference champion San Jose Sharks in his first-ever Stanley Cup playoff series, McDavid is preparing for another dose of Kesler and the big and heavy Ducks in Round 2, starting Wednesday at 10:30 p.m. ET. "(Kesler) has been up for the Selke (Trophy) for however many years in a row, so that speaks for itself," McDavid said Tuesday before the Oilers flew to Anaheim. "He understands his defensive role." McDavid acknowledged this series will be different than their first-round win. "San Jose was a team, they didn't want to engage us physically (in the first round) and they didn't want to get some of our big guys emotional and get that going," McDavid said. "I feel like Anaheim isn't going to shy away from that kind of game." McDavid had zero points, eight shots and won just eight of 19 faceoffs against the Ducks this season. In the final three meetings, he had two goals, seven points and a plus-5 rating while ramping up his ice time from 19 minutes 51 seconds to 24:27. "What we try to do as much as we can is keep him in his own end and the only way to do that is forecheck him," Kesler's linemate Andrew Cogliano said. "When the time is there, you can get physical with him but for the most part, you've got to play more of a mind game with him." A crafty veteran, Kesler is one of the best at hacking or needling a player and then breaking the heart of the opposition with a goal. Kesler also forms a 1-2 punch with six-foot-four, 220-pound Ryan Getzlaf on the penalty kill and dominates in the faceoff circle. The 32-year-old Kesler posted 58 points in the regular season — his most since recording 73 with Vancouver in 2010-2011 — but managed only an assist in a four-game sweep of Calgary in the first round. Earlier this season, Kesler had two goals and won 58.9 per cent of his faceoffs in five contests against Edmonton. Considered the NHL's No. 1 shutdown guy, Kesler recently was named a finalist for the Selke Trophy after winning 55.5 per cent of his league-high 773 defensive-zone faceoffs this season. Kesler won the award as the NHL's top defensive forward in 2011. "He does some sticking that kind of wears on guys in the playoffs and, positionally, he's always been sound," Cogliano told reporters on Monday. "When he's in the offensive zone, he's tough to handle and he often makes star players play D."
McDavid sealed Edmonton's first-round win with an empty-net goal in the final second of Game 6 at San Jose, and finished the series with two goals and four points. But the Oilers are hardly a one-man show, with their top line of Leon Draisaitl, Patrick Maroon and McDavid combining for 35 per cent of the team's goals in the regular season. Draisaitll has six goals, including all three game winners for Edmonton, against Anaheim this season. Fourth liners David Desharnais, Anton Slepyshev and Benoit Pouliot were key contributors in Round 1 while goalie Cam Talbot was stellar in five of the six games after posting a 2.39 goals-against average in a career-high 73 games in the regular campaign. Edmonton also boasted a 31-7-3 record when opening the scoring in the regular season and won all four of its games in Round 1 versus San Jose after striking first, courtesy of Zack Kassian twice, Draisaitl and McDavid. But it will probably take more than McDavid and scoring first for the Oilers to eliminate Anaheim, which is undefeated in regulation in 18 straight games, has prevailed in 10 of the last 14 meetings, and is 16-1-3 in its past 20 trips to Edmonton. "They've got a tremendous amount of confidence right now after being Calgary [four straight]. The Ducks are playing at their peak," Oilers head coach Todd McLellan said.